BANGI, 14 Nov 2012 – Community development which was missing in the country’s planning needed to be reemphasised to enhance development in the economic and social spheres. 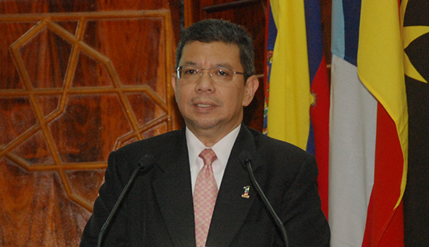 Deputy Minister of Higher Education, Dato’ Saifuddin Abdullah said this when opening an International Seminar on People-Centred Development: “Enhancing Social Inclusion Through Community Social Enterprise”, at The National University of Malaysia (UKM) campus here earlier this month. The two day seminar was organised by the Commonwealth Association for Local Economic Development (COMMACT) Malaysia in cooperation with the Faculty Economics and Management (FEP) and Institute of Ethnic Studies (KITA) of UKM and University Utara Malaysia (UUM), Kuala Lumpur Campus. He said community development was related to COMMACT Malaysia and applauded efforts by its President, Prof Datuk Mohd Yusof Kasim, in reviving the organisation. He said Malaysia practices a three tier government system at the federal, state and the local council. He felt that there was a need to bring back local elections so that community development would hopefully then become mainstream. But even without Local Council elections, community development deserved to be emphased and he welcomed the revival of COMMACT Malaysia. What was missing at the community or grassroots level was a platform where all the stakeholders actually sit down and discuss many issues of community and to listen and to be heard, he said. Dato’ Saifuddin said local council full board meetings are actually opened to the public but lamented how many such meetings were seldon allowed to be attended by members of the communities concerned. Recounting his days as a member of the Temerloh Local Council, Dato’ Saifuddin said that his fellow councillors were not too keen for their meetings to be attended and heard by the community. After he was promoted to become a deputy minister he started his own local council called the Temerloh Parliament Consultative Council, where he currently has 160 members. He said understanding what people at the grassroot level want is key to pushing for community development, even if the concept of community development itself has changed with time. Dato’ Saifuddin said because the country has changed, the people in power must also understand and comprehend and connect with the changes and the changing society.